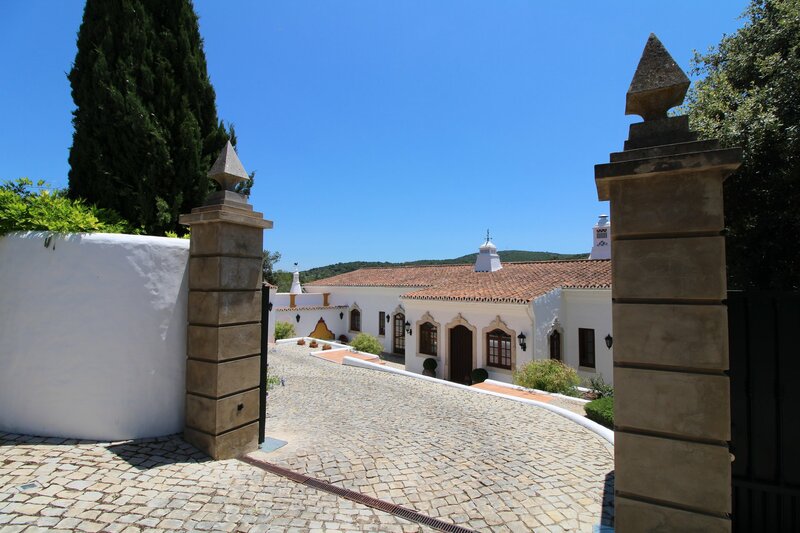 Magnificent, traditional 4 bedroom villa located in the peaceful countryside of Loule with stunning private seawater swimming pool set in mature gardens in a large plot with amazing views over the countryside. This majestic property has wonderful traditional spacious accommodation comprising inviting hallway, lounge, dining room, office/snug, fantastic country fitted kitchen, 4 bathrooms, 4 bedrooms - 3 being double and ample storage. 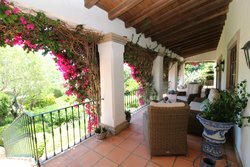 With great attention to detail this villa is immaculately presented has an amazing al fresco dining area complete with sunny terrace, poolside cabana with outside bar, kitchen and built in barbecue which is a fantastic feature of this property. It has many unique features including electric gates, air conditioning, central heating, underfloor heating, alarm system, feature fireplace, beamed ceilings, garage and is completely gated and fenced. Loule is around 16km to the north of Faro. It is a large town with all the usual amenities you would expect to find - a great selection of shops, numerous banks, art galleries, swimming pools and sports pavilion to name but a few! The landmark church of Nossa Senhora da Piedade - a modern dome shaped building reminiscent of a space ship - can easily be seen on a hill, just to the west of the town, from the A22 motorway. Loule is famous for its Saturday morning gipsy market (at the end of Rua da Nossa Senhora da Piedade) it also has a really good daily market in the Arabian style market hall on Praca da Republica (open every morning except Sunday). Apart from the historical points of interest, there are also lots of cafes and shops in the criss-crossing network of cobbled alleys and streets and plenty of places to sit in the sunshine and watch the world go by. Broadband is widely available in Portugal and is known as 'banda larga'. It is considered to function better than broadband services in the UK due to the fact that Portugal was one of the last countries to embrace broadband technology and thus has a system with newer design and technology. There are several service providers offering ADSL, fibre and wireless services in Portugal to the residential and the professional markets. An eclectic mix of world famous luxury resorts and traditional Portuguese towns, central Algarve remains the heart of the Algarve region with beautiful beaches and coastlines. Central Algarve is home to the "Golden Triangle", a prestigious area between Faro and Albufeira, host to three world famous holiday and golf resorts: Quinta do Lago, Vale do Lobo and Vilamoura. These three resorts have cemented the Algarve's reputation as one of the best golf destinations in the world. Just as popular is the beach resort of Albufeira, which features vibrant wildlife and several gorgeous beaches. Not just resorts and tourism, central Algarve is also home to traditional towns like Sao Bras de Alportel and Loule, which are popular with British ex pats. Just as beautiful is the Ria Formosa National Park, a natural reserve that extends from Faro to Tavira. With a variety of well-developed resorts, central Algarve still retains its natural beauty and authentic splendour all across the region. The beauty of the central Algarve region is in its accessibility from the Faro airport, with many of the main resorts and towns all within a 30-minute drive from Faro airport, one of the reasons the central Algarve is popular with families. To reach Faro city from the airport it's a 10-15 minute drive or taxi ride, with the rest of the Algarve region opening up once you've arrived at Faro City's bus or train stations. Receiving more sun each year than California, central Algarve is a hotbed for beach lovers, especially in the summertime. With fairly low wind speed compared to the western Algarve region, the summers in central Algarve are long and dry, with up to twelve hours of sunshine a day. As for the winter months, temperatures sit at around 11°C to 18°C, making for a fairly warm winter season. The shorter days and increased rainfall will bring less sunlight, however, there are days in which temperatures reach as high as 20°C in the sunlight. Ria Formosa National Park – It's no surprise that this national reserve was recently elected one of Portugal's seven natural wonders, with its spectacular coastal lagoons and wetlands making it a paradise for nature lovers and bird watchers. From guided walks to kayak trips through the lagoon, this national reserve has something for everyone. Faro - The capital of the Algarve, Faro stands as a picturesque beach town which offers a brimming nightlife and historic Portuguese sights and architecture. From the well-preserved "Old City" and its cobblestone streets to the Faro Jewish Heritage Centre, you've got plenty of history to look at throughout the city. The multiple kilometre long Praia de Faro beach offers room for anyone to set a towel down and relax in the sun as well. Why Buy Property in the Central Algarve? Central Algarve is the heart of the Southern Portuguese coast and is one of the most sought-after European tourist destinations. With a stunning national park and beautiful beaches just within a few kilometres of Faro, central Algarve is also home to a variety of small Portuguese towns if you're looking for an authentic Portuguese experience. 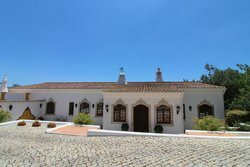 Since central Algarve is the hub of the Algarve you'll find a large range of available types of homes and property. From plots of land and luxury villas along the coastline to villas and apartments within the beach towns and fishing villages, Central Algarve is full of options. You'll also find a variety of fabulous villas and houses spacious enough for families and close to the many golf resorts, catering for families and golf lovers alike. Some of the most popular places to live in Central Algarve include Vilamoura, Sao Bras de Alportel, Vale do Lobo and the prestigious Quinta do Lagos.